After visiting Houston the Silhouette Secrets film crew were invited to a lunch by SCONE. We met “Silhouette Cutters of New England” at the Wayside Inn, near Boston. We knew nothing of the Wayside Inn’s history or it’s connection with the art of silhouette. It’s hard to believe that a year has passed since we began planning the film. This time last year we had just launched the first of two crowd-funding campaigns. We managed to put together a budget (albeit a meagre one) and arrange a filming schedule. We’ve travelled all over the UK and America, shooting over 80 hours of footage. This is enough to make a full-length feature film should we be so inclined! We’re now midway through the seemingly-endless task of sifting footage, deciding what should stay and what must go, and then stitching it all together with a voice-over narrative. Our travels began in London in the archives of the National Portrait Gallery. They took us to the Regency Town House in Brighton and then to a freezing cold dawn on Llandudno Pier in North Wales. We were tracking down the lives of past silhouettists. We’ve shot footage in cars, on trains, in public streets and parks, even from a motorcycle sidecar! In America we went to new York, Boston, Philadelphia and – most notably – Houston. It was there that I challenged the world record for speed-cutting silhouettes. 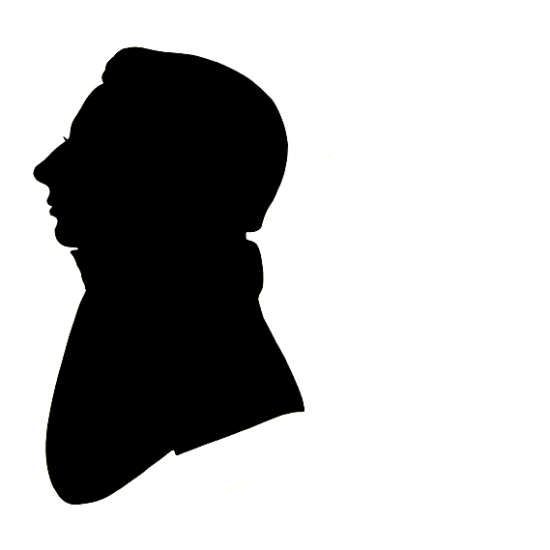 During lunch at the Wayside Inn one of the SCONE artists produced a silhouette by August Edouart. I recognised it by the signature and was able to say a bit more about it. Because of the way it had been remounted I could see it might be one of Edouart’s duplicate silhouettes, rescued from a shipwreck off the coast of Guernsey in 1849. At the Wayside Inn I learned about the poet Henry Wadsworth Longfellow. This sequence is unlikely to make it into Silhouette Secrets, but makes an interesting addition to the “Silhouette Snippets” series of short videos. I’ve learned that there are only a handful of silhouette cutters left today so a movie about Silhouette Secrets is a must as we of the computer age may be seeing the last generation of silhouette artists and it will be great to document the secrets of the silhouette art for posterity! Great blog, Charles. There’s something about having your silhouette done that could never be replaced by photography or anything computer-generated. Having you doing silhouettes of our wedding guests is one of the things that made the day extra special. People have been predicting the death of radio for decades!